WANT TO SHAPE THE FUTURE OF YOUR BUSINESS LIBRARY? JOIN US FOR A FREE LUNCH AND A FOCUS GROUP FOR CBS STUDENTS! We want to know what would be high impact for YOU in a new business library. Help us design a library for the future. RSVP at bit.ly/BizLib or just show up. This entry was posted in Watson Outreach on April 22, 2019 by Michael. At all other times during these two weeks, i.e. after 7pm until close and all open hours on Saturday and Sunday, access to Watson Library is available to all University affiliates. This entry was posted in Hours on April 20, 2019 by Michael. From 8am to 7pm, Monday to Friday, February 25th to March 14th, Watson Library is open to all current graduate students, undergraduates in Economics, faculty and staff. At all other times during these three weeks, i.e. after 7pm until close and all open hours on Saturday and Sunday, Watson Library is available to all University affiliates. If you need materials or services during the 8am to 7pm period designated above and you are not in one of the groups listed please ask a library staff member for help. 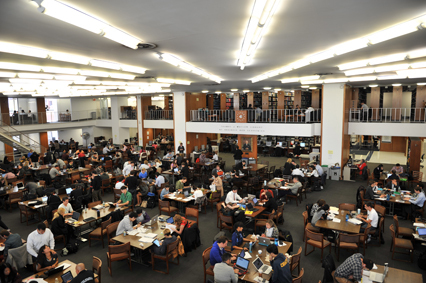 Study space is available in Butler Library, Lehman Library (3rd floor of the International Affairs Building), and the Science and Engineering Library (campus level of the NorthWest Corner Building). This entry was posted in Hours on February 20, 2019 by Michael. The Watson Library of Business & Economics will close at 7pm this evening (Friday, January 18th) and remain closed through this weekend and the Martin Luther King Holiday: Saturday, January 19th through Monday, January 21st. The rest of Uris Hall will also be closed for this 3-day holiday weekend. This entry was posted in Hours on January 18, 2019 by Michael. This entry was posted in Hours on December 21, 2018 by Michael. At all other times during these three weeks, i.e. after 7pm until close and all open hours on Saturday and Sunday, access to Watson Library is available to all University affiliates. This entry was posted in Hours on December 13, 2018 by Michael.